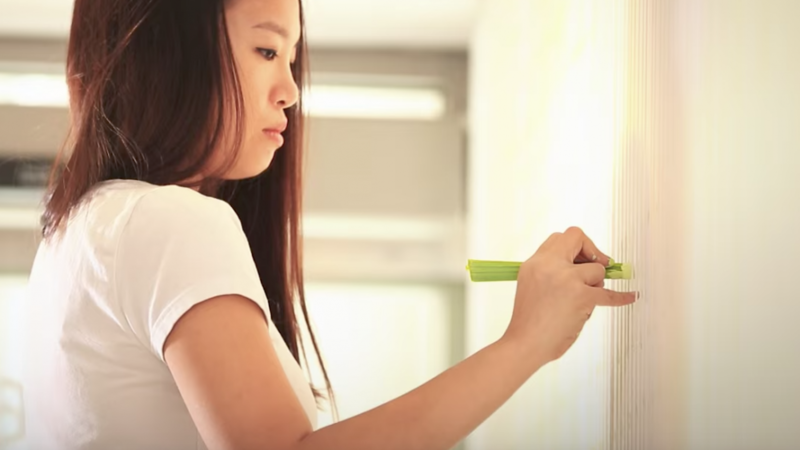 In somewhat more quirky ways of using celery – did you know that it’s possible to do some painting with celery? Have some fun with the kids! The video above is a bit more of a fine art attempt with the humble celery bunch than we imagined, but printing with celery is a tried and tested, great way to spend some time with both big and little kids. Want to print some flowers? Simply save the end part of a celery bunch and tie with rubber bands to keep the stalks together. Dip into the end of a shallow dish of paint–not too deep or you’d just end up with a smudge–and start printing! For best results, watch the amount of water that’s in your paint: too thick and it might clog, too thin and you might ruin your paper. The rose-like pattern will look great on greeting cards, wrapping paper, decorative patterns, or anything that you can think of. Alternatively, get inspired by the video above! The lined wall is probably a more complicated setup than you can do at home, but tracing out some ruled lines using a light pencil and some white or black card will work just as well to get those beautiful patterns going. Have fun! And feel free to share with us any artistic results.